Welcome to Truly Sopel’s Undie-World! Inspired by sleepover parties and the dreamy aura of the the bedroom, here you find Truly’s head-turning collection of cute and comfy cotton knickers and sleep-sets, satin shaper pants and lounge wear. We are big fans of the ‘fuller brief’ but also love prettiness and femininity, expressing natural confidence in a cheeky way. We stock a unique variety of the best quality cotton prints and are continuously sourcing and designing new and unusual fabrics so that we can add more fun themes and keep the current ones exclusive and exciting. All of our ranges are designed and made in our UK based studio and are dispatched within five days of ordering. 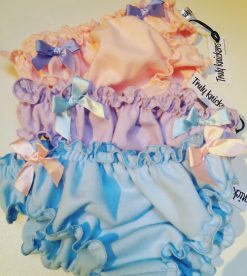 Each knicker is hand finished with a ribbon bow which we tie and sew on to perfection and then package perfectly on its way to you!